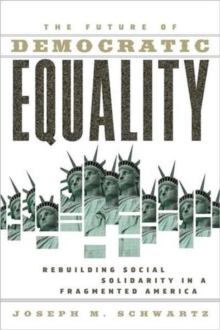 2011 David Easton Award, presented for the best book by the Foundations of Political Theory section of APSA:"The Future of Democratic Equality, by Joseph Schwartz, takes on three tasks, and accomplishes all brilliantly. Any one of these tasks well fulfilled would have been a laudable achievement. First, Schwartz argues for the centrality of the question of equality to democratic politics. Second, he critically analyzes and explains the shocking rise in inequality in the United States over the last three decades. This he does with conceptual clarity, rich interdisciplinary analysis, and a thorough examination of hard socioeconomic data. Third, he assails the near absence of concern for this soaring inequality among contemporary political theorists, and offers a cogent, and stinging, explanation that takes to task the discipline's preoccupation with difference and identity severed from the pragmatics of democratic equality. The Future of Democratic Equality is a courageous and disciplined effort to tackle a hugely important political problem and intellectual puzzle. It well embodies the spirit of the Easton Book Award by providing well-grounded normative theory targeted to an urgent matter of contemporary concern. It is a must read for anyone who cares about democracy." - Respectfully submitted by Leslie Paul Thiele, University of Florida (chair) and Cary J.
Nederman, Texas A&M UniversityWhy has contemporary radical political theory remained virtually silent about the stunning rise in inequality in the United States over the past thirty years? Schwartz contends that since the 1980s, most radical theorists shifted their focus away from interrogating social inequality to criticizing the liberal and radical tradition for being inattentive to the role of difference and identity within social life. This critique brought more awareness of the relative autonomy of gender, racial, and sexual oppression. But, as Schwartz argues, it also led many theorists to forget that if difference is institutionalized on a terrain of radical economic inequality, unjust inequalities in social and political power will inevitably persist. Schwartz cautions against a new radical theoretical orthodoxy: that "universal" norms such as equality and solidarity are inherently repressive and homogenizing, whereas particular norms and identities are truly emancipatory. Reducing inequality among Americans, as well as globally, will take a high level of social solidarity--a level far from today's fragmented politics. In focusing the left's attention on the need to reconstruct a governing model that speaks to the aspirations of the majority, Schwartz provocatively applies this vision to such real world political issues as welfare reform, race relations, childcare, and the democratic regulation of the global economy.